Selection and Testing of Nonwoven Materials and Application-Appropriate Adhesives Nonwovens | Fabrico, A Division of EIS, Inc.
Nonwovens are used in medical applications for surgical gowns and masks, wound care dressings, and surgical drapes. They can be made of natural materials like cotton, or man-made materials such as polyester, polypropylene, polyimide, rayon, and polytetrafluoroethylene (PTFE). Nonwovens can be sterilized, treated with anti-microbial agents, are soft and stretchable, and can either repel or absorb liquids, including wound exudate. Most nonwovens are used outside the body as disposable, single-use products. They are typically manufactured, sterilized, packaged, opened, used once, then disposed for less risk of contamination. 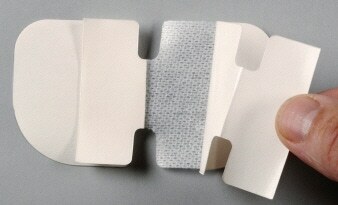 Most nonwovens used in medical applications are spunlaced, spunlaced and meltblown, or spunbond. They are suitable for many protective applications and can be treated to prevent water, blood, or bacteria from seeping through the fabric. Chemical performance enhancement can improve properties for moisture transport, flame retardancy, and abrasion resistance. Fabrico Medical can work with engineers designing nonwoven applications to select and test the nonwoven material, select and test an appropriate adhesive, and ensure that the design meets manufacturability requirements. Fabrico Medical can also ultrasonically weld nonwovens. Fabrico Medical offers slitting, laminating, precision die-cutting, and packaging of the finished product. With two FDA registered Class 10,000 (ISO 7) clean rooms, and ISO 13485 certification, Fabrico Medical meets industry and regulatory standards.